After completing the installation, why not get started with Kahina for SWI-Prolog by tracing a little example program, provided as kahina/kahinaswi/examples/example.pl. 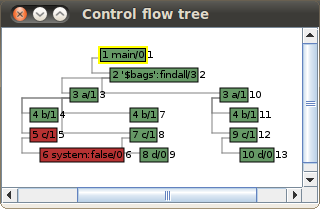 For understanding the use of Kahina's graphical tracing GUI, the tutorial for Kahina for SICStus Prolog may be useful. kahinaswi-test-tree.png​ (11.5 KB) - added by ke 7 years ago.